Chief Economist Jack Kleinhenz, Moderator of Opening Panel for NABE and OECD in Paris. 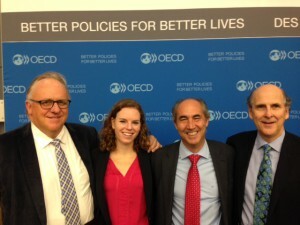 The National Association for Business Economics (NABE) and the Organisation for Economic Cooperation and Development (OECD) co-hosted a global economic symposium at the Paris headquarters of the OECD, May 23-24, 2016. The goal of the Symposium is to strengthen linkages and networks between leading business economists in the United States and their colleagues across the Atlantic through a dialogue and roundtable that will foster debate and the exchange of frank views on economic issues of mutual concern. This is the second such symposium to be co-hosted by NABE; the first was conducted May 2015 in Munich, Germany in conjunction with the Deutsche Bundesbank.